Title originally changed in the U.S. to Two Wheels Good due to objections from McQueen’s estate. Like any art form, pop music is full of artists whom never became household names, yet have retained a cult of enough fervent admirers to be remembered decades after they left their mark, no matter how small. 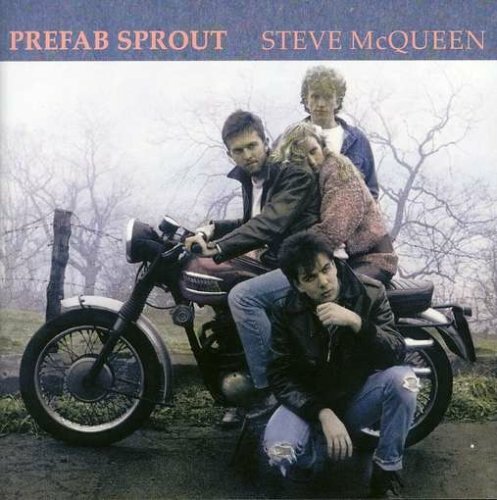 A vehicle for English songwriter Paddy McAloon, Prefab Sprout are best known for a series of albums released between 1984 and 1990. They’ve recorded sporadically since then (most recently 2013’s Crimson/Red), but my guess is that most think of them as an ‘80s band for two reasons: they were semi-popular at that time (in the U.K., anyway) and those albums sound overwhelmingly of that time. Nearly every synth and drum machine on their second full-length, Steve McQueen practically screams 1985, instantly dating it. However, much like the rest of McAloon’s oeuvre, it’s also oddly out of time—other music from the mid-80s might sound similar, but little else from that era or beyond feels much like it. Despite the band’s cover motorcycle poses and the album title-referencing actor (the epitome of anti-hero cool), no one would ever accuse McAloon of being a rocker. An ‘80s equivalent of Steely Dan’s irony-drenched jazz-pop is a good jumping-off point for describing Prefab Sprout’s sound—what, if anything, are the album cover and title meant to be if not ironic—but McAloon also liberally incorporates Tin Pan Alley-derived craft and Brian Wilson-like experimental song suites into his overall aesthetic. On one level, Steve McQueen is ostensibly pure pop music, driven by traditional melodic hooks, verse-chorus-verse structures and McAloon’s boyish, clear-as-a-bell croon. Still, look beyond those obvious, accessible surface pleasures and stranger, more idiosyncratic qualities emerge, such as extended instrumental intros and outros, shifting time signatures (“Horsin’ Around”, for instance, carefully vacillates between bossa nova and swing tempos) and, in a most explicit nod to Steely Dan, no shortage of delectably acidic lyrics. McAloon chose Thomas Dolby (of “She Blinded Me With Science!” fame) to produce Steve McQueen, which accounts for its overtly synthetic sound; he also asked Dolby to pick the track listing from a vast catalog of tunes he’d composed on his Spanish guitar and had been storing up for years. Interestingly, all of Dolby’s selections were written in 1979 or earlier. Had these songs been professionally recorded then, they would not have sounded like anything on Steve McQueen. It’s tempting to claim that the finished album is as much Dolby’s as McAloon’s, for Dolby’s preference for a deliberate artifice in his production—in other words, making music that could only come from a studio and is near-impossible to reproduce live—effectively heightens the irony in McAloon’s songs while also highlighting the subtleties apparent in them. One can listen to the album wondering what in the heck McAloon’s singing about, then not caring because it all sounds so great only to have some sort of epiphany on the tenth or twelfth listen (or perhaps minutes, hours, or days after the song is over). Steve McQueen’s first track may be its most atypical one: “Faron Young” begins with a twangy four-note guitar riff, followed by a purposely stiff, quick, almost new wave-paced beat and a sample of a gunshot. McAloon sings of listening to the titular country star on the radio, his lyrics rife with wordplay, alternating “You give me Faron Young” with “Forgive me, Faron Young”; meanwhile, harmonica and banjo weave in and out of Dolby’s production and a jarring electronic noise appears in the extended, deconstructive outro. It’s a catchy opener, but the next song is more representative: The first thing heard on “Bonny” is a mysterious blowing wind, which remains as a ticking hi-hat and a jazzy guitar riff kick off the song proper, a lush palette of diminished chords and multi-tracked textures gradually building until it reaches full force in an exultant, impassioned chorus. The next three songs follow nearly the same template: “Appetite” and “When Love Breaks Down” both have now-cheesy seeming synth intros that nonetheless soon blossom into glorious, sparkling walls of sound equal parts fellow ‘80s sophisti-pop group The Style Council and 10cc’s classic gauzy ‘70s hit “I’m Not In Love”. “Goodbye Lucille #1” more of less achieves the same thing, only with an intricate, impossibly beautiful web of acoustic and electric guitars that surges into what may be McAloon’s most urgent chorus, his gentle “Johnny, Johnny, Johnny’s” giving way to this about-face: “Life’s not complete till your heart’s missed a beat / and you’ll never make it up or turn back the clock.” It’s followed by a startling, sinus-clearing repeated howl of “No you won’t!” as everything behind him clicks into place. All three songs, along with “Faron Young” were released as singles (only “When Love Breaks Down” hit the UK top 40); together with “Bonny”, they make a compelling argument for McAloon as a misunderstood, unjustly obscure pop genius. The album’s second half is not so much obscure or inaccessible as it is varied. “Hallelujah” is jazzier than anything preceding it, with upbeat wordless melodies sugarcoating more pointed sentiments such as, “I believe that sweet talk, like candy, rots teeth,” or, even more bluntly, “No Hallelujahs,” which at this date seems like a rebuke to anyone who has ever covered the Leonard Cohen standard of the same name. Not even the wide-eyed grin “Moving The River” musically beams forth can obscure a wicked barb like, “I hear you’ve got a new girlfriend / how’s the wife taking it?” or erase the weirdness of a WTF hook that goes, “I’m turkey hungry / I’m chicken free!” “Horsin’ Around” and “Blueberry Pies” must have been meant as throwaways (or, in a more positive light, palette cleansers)—the apostrophe in the former’s title even gives it away. “When The Angels” closes Steven McQueen with reverence tempered by a healthy dose of cynicism (a church organ intro, obviously fake horns, a proto autotune hook enhancing the words “Heart-faced little bastards”). But then there’s “Desire As”, the album’s real centerpiece, right in the middle of side two. As a series of lone synth chords hesitantly hang in the air, McAloon tenderly sighs, “I’ve got six things on my mind / you’re no longer one of them,” (kind of prefiguring Jay-Z’s “99 Problems” by nearly two decades). Eventually accompanied by a barely-there rhythm section and a sax player (regulation for ‘80s pop), he returns to this line again and again along with another providing the countermelody (“Desire as a sylph figured creature who changes her mind?”). For over five minutes, this Mobius strip of a song really does play as if on an endless loop, albeit one containing variations that smooth out any notion of repetition, replaced by an irresistible seductive ennui. I could listen to “Desire As” on an actual endless loop and probably not tire of it—one of those songs that reaches some sort of perfect stasis for me, but damn if I can fully explain how or why. That might be one reason for Steve McQueen’s perseverance through the decades: it entertains and even soothes like a good piece of popular art should, yet it remains singular and at times, a little mysterious. Up next: Drowning, not waving.